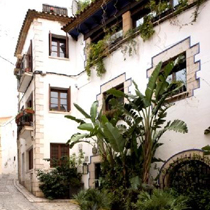 This charming property of Spanish colonial architecture, built in 1878 and included in the “Register of Historical Heritage” of our town, is located in one of the most beautiful and representative areas of the old town of Sitges. It has been recently restored and redecorated, fully respecting original features and even more, if possible, enhancing its natural beauty. Having undergone complete renovation, this building now proposes luxury accommodation services in “Suite” style rooms only for adults, which, in their diversity, meet three common elements: elegance, exclusivity and comfort. Moreover, from our terraces you can enjoy absolutely stunning views of Sitges and the Mediterranean. All these to make your stay unforgettable!.